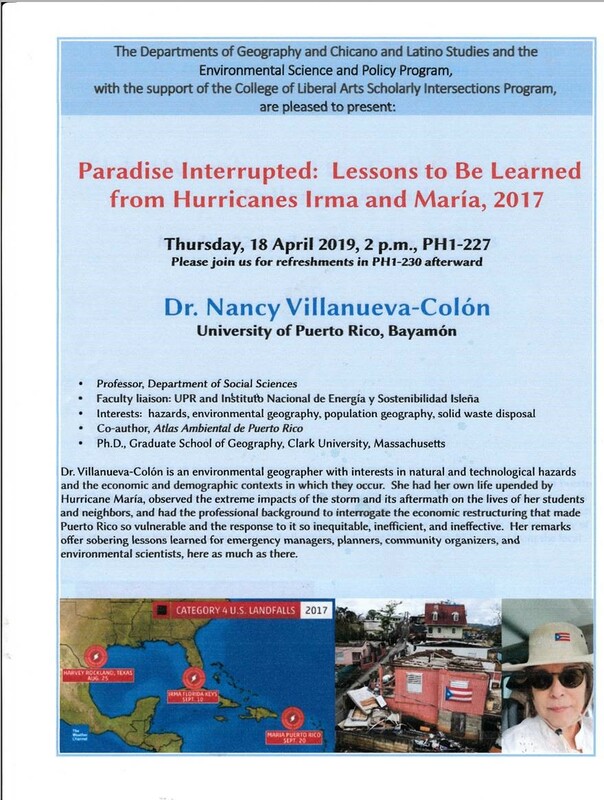 Dr. Nancy Villanueva-Colón is an environmental geographer with interests in natural and technological hazards and the economic and demographic contexts in which they occur. 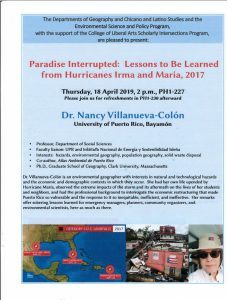 She had her own life upended by Hurricane María, observed the extreme impacts of the storm and its aftermath on the lives of her students and neighbors, and had the professional background to interrogate the economic restructuring that made Puerto Rico so vulnerable and the response to it so inequitable, inefficient, and ineffective. Her remarks offer sobering lessons learned for emergency managers, planners, community organizers, and environmental scientists, here as much as there. Please join us for refreshments in PH1-230 after the talk.